Chaille Trevor’s part memoire and part appraisal of her late husband Elleston Trevor’s books is subtitled ‘intimate glimpses into his life and work’ (e-book, 2012). 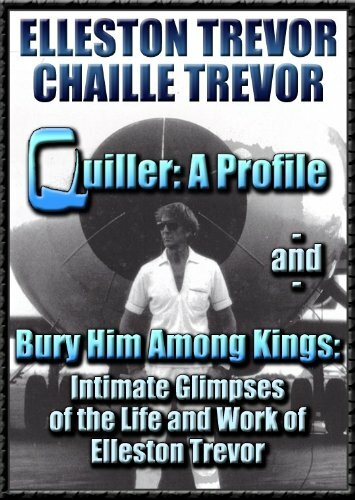 The profile on Quiller, his shadowy secret agent, is written by Elleston Trevor (Adam Hall) and is only three pages, though enlightening. Elleston Trevor was a prolific author, first published in 1943 under his own name of Trevor Dudley Smith; he used at least eight other pen-names. A good number of his books were re-issued either as by Elleston Trevor or by Adam Hall. He wrote in several genres – mainstream, children’s, thrillers, espionage, mysteries and plays – until his death in 1995. The recent sad death of author Philip Kerr brings Elleston Trevor to mind. Kerr bravely fought cancer, determined to deliver his last manuscript, Metropolis (his fourteenth Bernie Gunther novel) to his publisher. Throughout, Chaille uses quotes and references from many of his twenty-one children’s books, where he could employ his poetic muse. His Hugo Bishop mysteries, each with a chess title (published in the 1950s) were re-issued under his Adam Hall name when the Quiller books became best-sellers. There’s a lengthy appraisal of his 1970 novel Bury Him Among Kings, which is about a family in the First World War and a lot besides. Elleston Trevor had a great thirst for knowledge and believed that life was to be lived, yet surprisingly managed to write so many books! Chaille Trevor has produced a moving memoire.